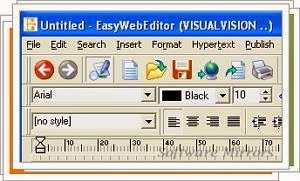 Easy Web Editor incorporates a familiar and intuitive interface design, and a wide variety of diverse tools: link building, real-time display while editing the page, many text formatting options export pages, creating frames, images sensitive mouse and more. Easy Web Editor marks the end of excuses for not having a website on the Internet. This is an extremely easy to use with which you can program your own website in a few minutes. You do not need any programming skills, since all work is fully developed graphically. All you need is a rough idea of ​​what you want it to be the final look of your website and let Easy Web Editor do the rest . As if this were not enough, if you have some programming skills, you can add your own source code. Easy Web Editor also have a built-in FTP client tool to publish your web site to get online.